“I am Duaa and this is my father Anwar. 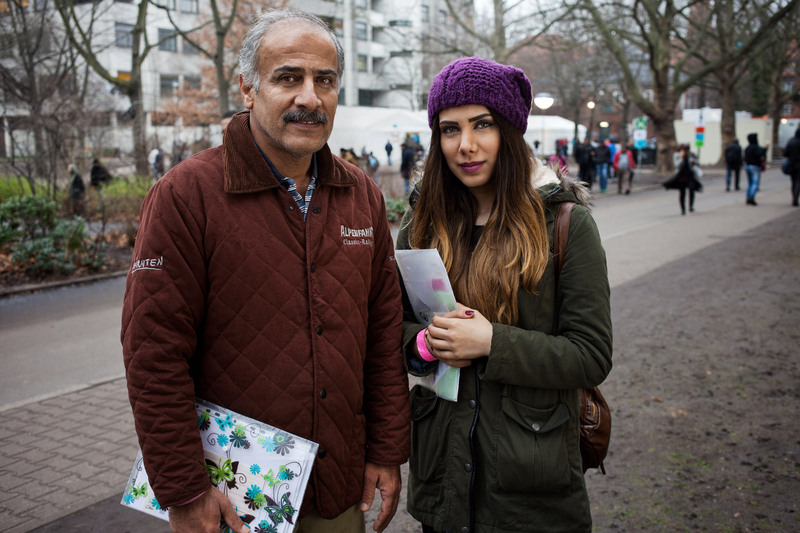 We came here as a family of five and fled from Baghdad, Iraq. The conflicts between Sunni and Shia led to constant repression and made it an unsafe place for us to live in. For us, all people are the same and should be treated equal. We heard in Syria is less tension between the different ethnic groups. So we moved to Syria for six years. We are very happy to be in Berlin now. Our ‘camp’ (the official temporary shelter) is a stressful place, but we try to make the best out of it. Our dream is to find a small place for our family and to be able to sleep in privacy again. My father is a men’s outfitter and in Arabic his name means ‘the brightest’. I studied graphic design, but I would love to become a photographer.